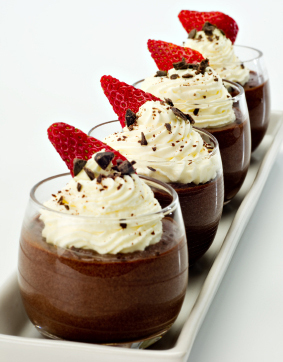 When I think of puddings, velvety, rich chocolate pudding comes to my mind. Some of you will immediately think of a rich, decadent vanilla or a refreshing strawberry maybe. And we would be right, these are puddings. However, pudding did not start out to be sweet treats. This is going to totally gross you out. Originally they did not mix milk, sugar, rice tapioca or chocolate. Are you ready for this? Pudding was originally a pig’s intestine filled with minced meat and oatmeal. Ewwwww. They boiled it until is was cooked good enough for them. And they called it pudding. Actually, it’s like our sausages are today. It wasn’t until the 16th century that the word pudding materialized into a sweet desert. Milk, sugar and flavorings were poured into a cloth back and boiled until the contents congealed. In amedium saucepan, whisk together the sugar, cornstarch, cocoa, and salt. Gradually whisk in the milk, then the egg yolks. Cook the milk mixture over medium heat, whisking constantly, until thickened to the consistency of mayonnaise, 7 to 8 minutes. 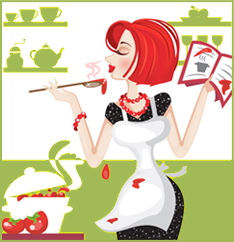 Continue to cook, whisking, for 1 minute more. Remove from heat and pour through the sieve into the bowl, pushing the mixture through gently with a rubber spatula or spoon. Add the butter and chocolate and stir until melted. Press a piece of plastic wrap directly on the surface of the pudding and refrigerate for at least 2 hours and up to 2 days. Before serving, gently stir the pudding to loosen it.